If you ask anyone that where to find the best kebab in Dhaka, the answer will come immediately to you as the place is familiar to all people of Dhaka city and the place is Mohammadpur. You would have to go to Geneva Camp in Mohammadpur, which is more commonly known as 'The Bihari Camp' -the largest settlement of Biharis who were left stranded after the Liberation War of 197l. Though the shops are not as big as other modern shop in the capital, the kabab shop at Geneva Camp has gained popularity for its kebabs, beef and mutton chups. With nowhere to go, and basic skills, some Biharis turned into day laborers, some took the occupation as a barbar, and some like the ones in Geneva Camp put their culinary skills to the test and got down to restaurant. And they have get acceptance from the food lover for long. Kebab, which is charred spicy meat, is a staple item in the Pakistani cuisine, has been adopted in the South Asian restaurant menu for decades now. 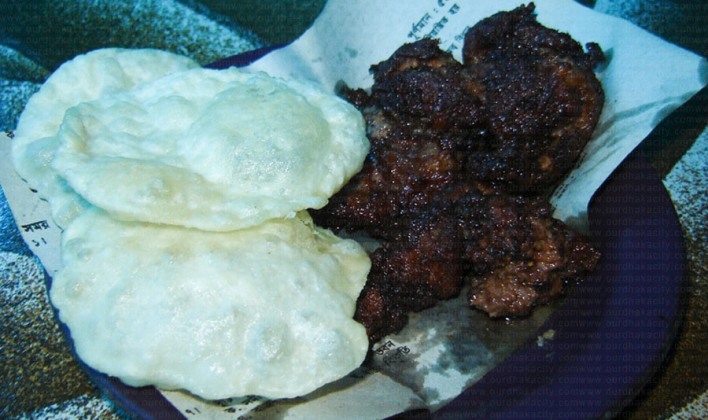 In Bangladesh it is considered as a comfort food and thanks for its spicy and deep fried texture, it’s a tasty treat for all. The kebab shop is a small one room restaurant with seating arrangements for only few people. The food being fired in vegetable oil, 97% of them consisting of meat so it’s a no entry place for vegetarians and health conscious people. Before a decade, the shops were shabby and unhygienic. But the environment has somehow changed but you could not find anything like modern kabab shop. Around five shops in the area offer a variety of kebabs that bring in thousands of people from different areas of the city throughout the year. And the best part is, it comes real cheap. One can have these meat items for a little less than 100 taka. Mostakim Variety Kabab and Soup is the most popular restaurant in Mohammadpur area. The owner of the shop Abdullah Al Mamun claims that his shop is the first one in Mohammadpur which stated in 1982. Now the Mostakim Variety Kabab and Soupt is the largest Kabab shop in that area which can accommodate 100 customers at a time. To give the opportunity to sit more customers, it makes arrangement in the both sides of the road. With varieties of kebabs like beef, chicken and mutton chaap, kebabs, curries and fried cow brains, other parts of the animal like liver and heart, and the must have item- the chicken corn soup. Lassi, Sarbat and Faluda are also available in summer season. "We have been running our shops for the last 35 years. Initially we just sold different types of kebabs in front of Mohammadpur Government High School, but now we are running three kebab shops in the area," said wife of Mustakim, owner of Mustakim Varieties Kebab and Soup Shop. Rahim Varity kabab is one of the most renowned Kabab shop in Daka. It has a sitting arrangement of 40n customers. The shop remains open for customers from 3:00 to 1:00 Am. Soup, Tikia, Beep Chup, Cattle brain and Shami kabab are available here. If you are gasping for a glass of cold drink items; you could get it within a moment. The proprietor of the shop Mohammad Habib said, sometimes we have to face lose in political turmoil period like hartal and barricade when our customers did not come here because of fear and transport shortage. And the costs of ingredients go higher which suffer us very much. Although the shop seems to be a big but it has only arrangement for 50 customers. The owner has to face a difficulty in evening time when hundred of customers flocked his shop for kabab and Luchi. The restaurant stats it journey before 25 years and still realizing the demand of thousands food lovers of Dhaka. Wahid, a staff of Muslim Kebab and Soup Shop, said their beef chups, chicken fry, pigeon fry, cow brain fry and khiri kebabs are in high demand. He said the customers come to their shop all year round for its chups. If anyone comes here once he must have to return again because of its test, Wahid said. Mohammad Raju, the owner of the New Muslim Kabab and Chup restaurant starts his business only 15 years ago but he already gained popularity to the customer all around the Dhaka. Interestingly, his father is the owner of Muslim Variety Kabab and Soup restaurant located very near to his shop. His father Wahid Hossen, operating this business in Mohammadpur area for more than 30 years. Raju starts his business with a small space but now his shop has a sitting arrangement for 50 people at once. His shop remains open from 3:00 to 12:00 AM. His all these items comes with sweet and sour salad and luchis (fried biscuits made of flour). Shah Alam, the possessor of the Mursalin Kabab shop has been running his shop for six years. He takes 60 taka for Beef chup, Bati kabab, Khiri kabab and beef brain while 70 taka for Mutton chup, Bati and brain. The customers have to pay 100 taka for it mouthwatering Chicken fry and 30 taka for corn soup. You could search out luchi in every shop which prices vary from 2- 5 taka. Arefin, a resident of PC culture housing, said he and his cousins frequent Mursalin kabab shops for its kababs and Chups. Oh and don't miss the small pan shops just outside the Kebab house. With various sweets and candies and sweet masalas and ofcouse the beetle-leaf (paan), it is one of the best replacements after meal candy one can ask for. And what's more, thanks to the natural properties of paan, it helps digest the rich, fried food you just had.